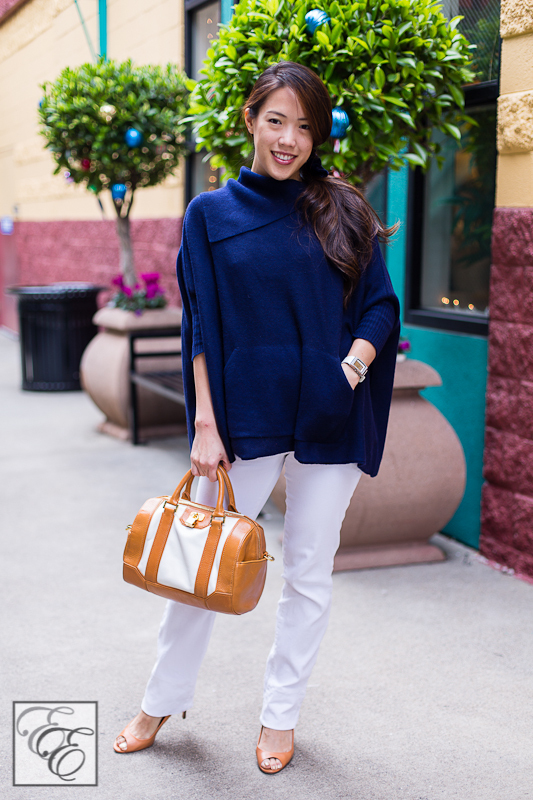 Cashmere has sprung up everywhere in stores this winter, and I’m loving it! Here’s a simple but put-together look perfect for running errands or shopping. The asymmetric wide-collar is my favorite detail of the poncho; I draw attention to it by pulling my hair to the opposite side. The relaxed fit feels like I’m walking around in a Snuggie (without commiting a fashion faux pas! ), but the 3/4 fitted sleeves provide lady-like structure. The center front pocket is perfect for burrowing my hands into when the wind gusts. I paired navy blue with whites because I like balancing light and dark contrasts, particularly in the colder months, when black is the predominant palette choice. 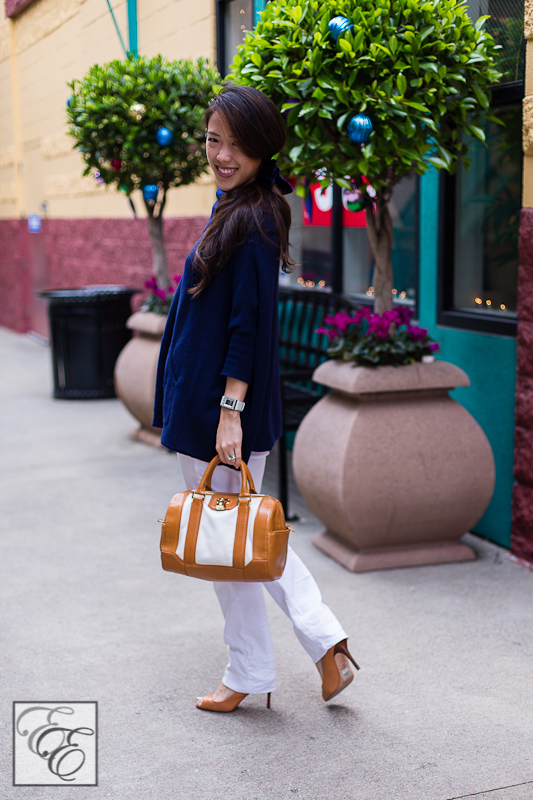 White pants – pure white, not just cream – can and should be worn year-round. Just be careful if the forecast calls for rain! The Tory Burch satchel keeps its structure well and the leather trim gives great visual contrast. A long cross-body shoulder strap (not shown here) provides versatility for when you need your hands free. The small gold padlock is a fun, precious embellishment that hints of treasures inside… My treasure – a SLR with 50mm lens attached – fits very comfortably inside, with space to spare for a wallet, phone, and more! Velvet is a beautiful fabric, and in the form of an accent bow, is a timeless classic. 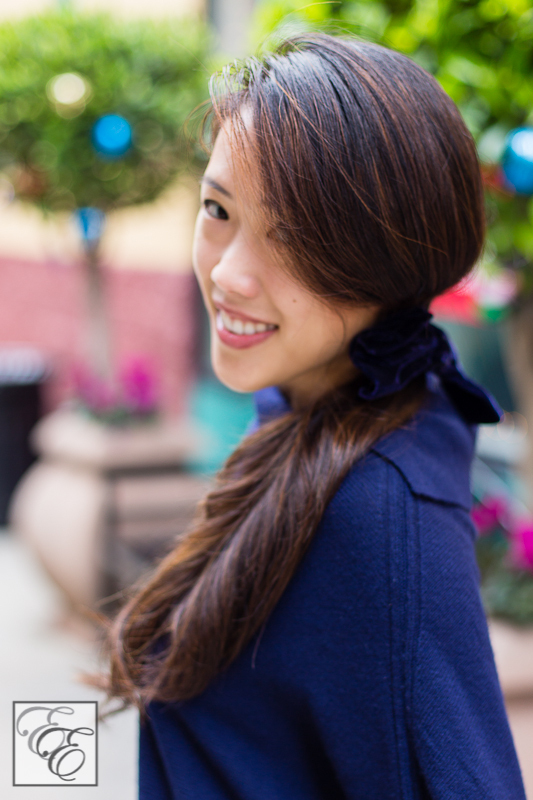 You can prevent it from looking too “cute little girl” by framing your face with soft unstructured waves, and by placing the bow lower, close to the nape of your neck. Cashmere and velvet; two of my favorite wintertime luxuries that are both cosy and chic. Please share your go-to winter staples!